This three pitch route is located on the Upper Tower and climbs the right side of the arête. The climb itself wanders a bit and generally follows the line of least resistance to the summit (many variations are possible). Most of this route is in the shadows during the evening. P1. Climb a steep dihedral directly across from Dovercourt. From the top of the dihedral, angle up and left, passing a headwall on your left. Continue a full rope length and belay on one of many ledges. P2. Climb a rather non-descript full rope length up small dihedrals and cracks, again keeping to the right of the arête. P3. Short scramble to the top of the tower, belay using small trees at the top of the ridge. Great views back up the canyon. 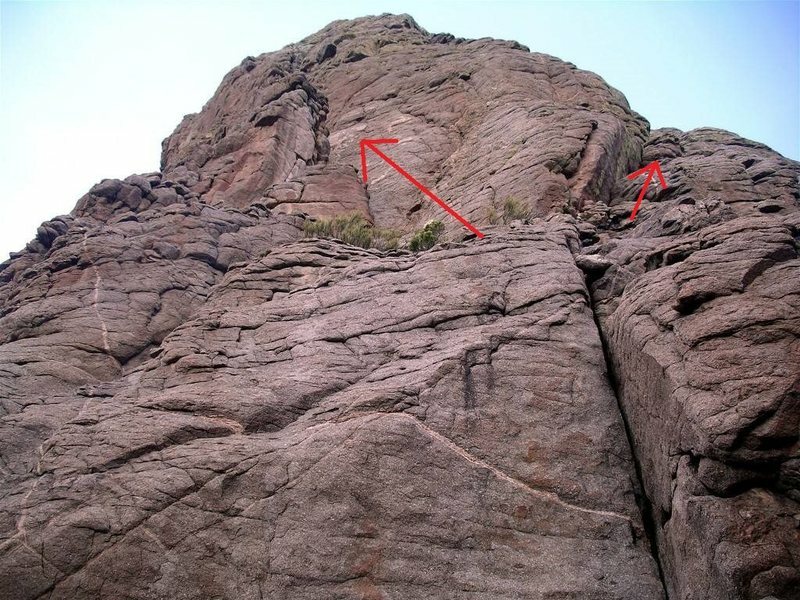 To descend, the guide recommends scrambling off to the northeast and following the low angle slabs to a descent trail. Probably a better option than our descent. We followed the ridge to a point where we could scramble down to the west, and then followed the base of the rock back to the notch between the two towers. Standard rack - Set of stoppers, hexes, and medium-sized cams. Looking at the Upper Tower from Dovercourt. From about 200 feet up on Betty & Ray's. Grant starting up the dihedral. Just curious which way the route goes after the dihedral on the first pitch? Can't tell from the pictures or description. Thanks. 1-star climbing and gear; 4-star position, views, and fun factor. In response to the question above, we veered left above the crack, then came back right a little to follow roughly the highest point on the ridge. I peeked out right a few times at what looked like much easier climbing but didn't see anything in terms of decent protection. The left side wasn't much better, but it did offer some sparse, small, mediocre gear. I'm curious to see what lines others took and if they offer better rock and pro.